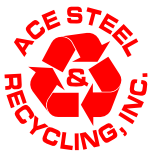 Recycling - Ace Steel & Recycling Inc. When it comes to recycling, we know what we're talking about. We are South Dakota's largest family-owned recycling company, and our family has been in business in South Dakota since 1968. We care about our communities and and families and will continue to invest in our shared future. We are a proud member of ISRI - The Institute of Recycling Industries. We buy and process aluminum, copper, brass, steel, stainless steel, insulated copper and aluminum wires and lead acid batteries. Whether you have beverage cans, auto parts, home appliances, plumbing fixtures, or electrical wire and components, Ace will help you convert your salvage materials into cash. Our site is designed to help faciliate your venture into recycling. You'll find information here on the various materials we accept and process, and we think you'll be surprised at how easy we make it for you. Questions? We're open 8-5 weekdays, and 8-noon on Saturdays. Give us a call at (605) 342-8649(Rapid City) or 605-945-1285(Pierre). We're waiting to help you out! RECYCLING SCRAP METAL CAN MAKE YOU MONEY! Many western South Dakota residents don’t realize that most scrap metal can be recycled for cash payments at Ace, which not only protects our environment and saves energy, but actually puts cash in your pocket! We often deal with customers that are in the trade industry that come across metal on a daily basis. Examples would be construction companies that may have steel beams from structures, electricians with wires and electrical equipment or plumbers with copper piping and brass fixtures. While we obviously see a large quantity of these metals from the trade industry, homeowners are always welcomed and encouraged to bring their own metal scrap to make money and recycle the metals with us. If the magnet sticks to your metal: You have a ferrous metal in your hands, something common like steel or iron. Ferrous metal is not worth as much when you bring it to the scrap yard, but the scrap yard will still accept it and make sure it is recycled properly. If the magnet does not stick to your metal: The metal you have is a non-ferrous metal. Many common metals, like copper, aluminum, brass, stainless steel and bronze are categorized as non-ferrous metals. These metals are very valuable to recycle and are worth more money at the scrap yard. Once you have your metals separated, you can call us at (605) 342-8649 to see which metals we accept, or just stop at our Eglin Street yard to learn about our recycling process. Over our years in business, we've found that homeowners can sometimes feel a little intimidated during their first visit, but we promise to do our best to make things as quick and easy as possible. Once your materials are unloaded at our dock, we'll sort and weigh them, then get you a ticket to redeem for a check at our front office. 1. The average person generates over 4 pounds of trash every day and about 1.5 tons of solid waste per year. 2. Americans make more than 200 million tons of garbage each year, enough to fill Busch Stadium from top to bottom twice a day. 4. Recycling one aluminum can saves enough energy to listen to a full album on your iPod. Recycling 100 cans could light your bedroom for two whole weeks. 5. Recycling aluminum cans saves 95% of the energy used to make aluminum cans from new material. Be part of the solution with Ace Steel & Recycling!